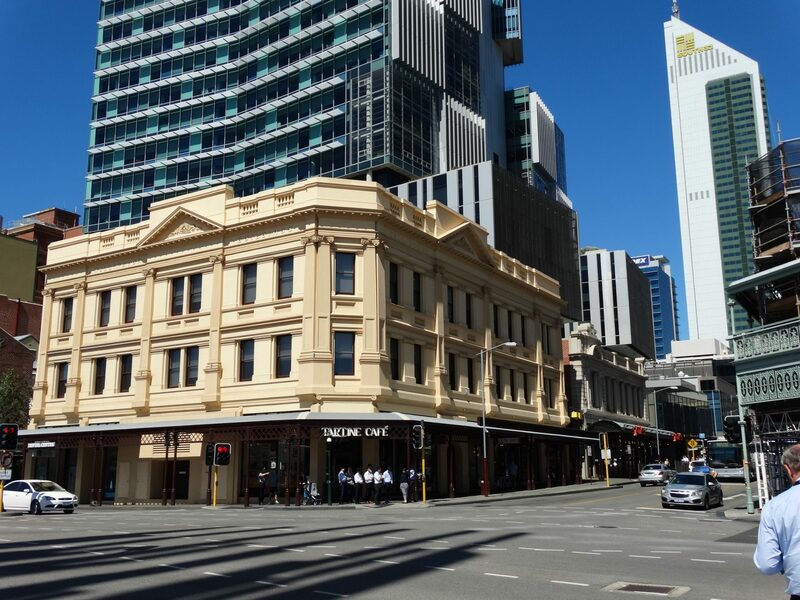 The Wellington Buildings are an integral component of a precinct of buildings in Perth from the Federation and Interwar periods reflecting the intensive building program during the gold rush period from the 1880s and up until World War One. During this time many of Perth’s original modest building stock was demolished and replaced with multi-storey commercial premises designed by prominent architects such as this one built for Harry Higham in 1910. Being near the railway line, this location was a highly desired location by Perth’s prominent businessmen, such as Higham, for establishing a broad range of retail shops as well as hotels, refreshment rooms and coffee houses and also warehouses. Wellington Buildings was not the first building constructed on this prominent corner site. In the late 1880s , Katanning farmer, Wesley Maley, purchased the land and built a single storey set of 11 brick shops with frontages to both William and Wellington streets. Maley sold his property in 1906 to Harry James William Higham, a successful pastoralist from the North-west who retired to Perth with his wife in around 1902. Higham had Maley’s original shops demolished to make way for a much more elaborate three storey building comprising a basement, nine shops on the ground floor and offices in the two floors above. The building was designed by architects Charles Oldham and Alfred Cox and built by contractor S. B. Alexander. Completed in 1910 it was called Wellington Buildings with the words ‘Wellington’ and ‘Buildings’ appearing in bas relief lettering on the building, but it was also known as Higham’s Buildings. The earliest shops included men’s and women’s fashion, a tobacconist, tea rooms, stationers, a shoe store and billiard saloon in the basement. The offices on the first and second floors had a variety of tenants and with the Railway Station just across the road, they attracted a number of railway related tenants. The Wellington Buildings was later purchased by Mary and Arnold (Joe) Raine who also owned the Wentworth Hotel on the opposite side of William Street. After the death of her husband in 1957, Mary bequeathed money from her husband’s estate to the University of WA to set up the Raine Medical Research Foundation and also gifted the Wellington Buildings to the University. In 2002, the State Government finalised its plans for a rail link south of Perth to Mandurah which involved the building of a railway tunnel underneath William Street including a new train station. Two options for the tunnel and station construction were considered both of which would affect many of the buildings located in the Wellington/Williams Street precinct, and which included possible demolition. However, because of the Wellington Buildings important heritage significance, it was agreed to retain it along with some of the other important buildings in the area. The Wellington Buildings are an integral component of a precinct of buildings from the Federation and Interwar periods reflecting the intensive building program during the gold rush period from the 1880s and 1890s and up until World War One. The central Perth business district totally transformed during this period with a considerable number of Perth’s original modest building stock demolished and replaced with multi-storey commercial premises designed by prominent architects such as this one built for Harry Higham in 1910. Being right near the railway line, this location was a highly desired location by Perth’s prominent businessmen, such as Higham, for establishing a broad range of retail shops as well as hotels, refreshment rooms and coffee houses and also warehouses. Together with the Royal Hotel on the opposite corner, Higham’s “Wellington Buildings” is a landmark at this main entrance to the Perth city centre. Wellington Buildings was not the first building constructed on this prominent corner site. In 1886, Wesley Maley initially purchased a portion of this land – being Perth Building Lot V20 – and then purchased the remaining portion in 1888. Maley, a farmer from Katanning and also an auctioneer and later member of Parliament, had invested in several city properties. Here he built a single storey set of 11 brick shops with frontages to both William and Wellington streets. His tenants included a fruitier, a jeweller, a tobacconist and newsagent, and a boot importer in the shops fronting Wellington Street, and in the William Street shops were a grocer, a butcher, an oyster saloon, refreshment rooms, a tobacconist and ‘fancy repository’. Maley sold his property to Harry James William Higham in 1906, making a handsome profit of over £40,000 sterling on the sale. Harry Higham was born in Western Australia and was well-known for his very successful pastoralist pursuits in the North-west establishing the sheep station “Nanutarra” in Ashburton and also farming land in the Williams district. He was married to Maud Mary Bateman, and had four sons and a daughter. Higham also was a long standing member of the Royal Agricultural Society including serving as President, and was also a Justice of the Peace. In around 1902, the Highams came to Perth to live in their home in Claremont which they also called “Nanutarra”. Having purchased the property right in the midst of the gold boom in WA, Higham had Maley’s original shops demolished to make way for a much more elaborate three storey building complex retaining the frontages to both Wellington Street and William Street. The building comprised basement area, nine shops on the ground floor and offices in the two floors above, and also included a modern electric lift. The building was designed by well-known architects Charles Oldham and Alfred Cox, and was built Simon Bremner Alexander, also a very well-known contractor in his day. Construction began in 1909 with the work and all fittings valued at a total of £18,000. Completed in 1910, it was called Wellington Buildings with the words ‘Wellington’ and ‘Buildings’ appearing in bas relief lettering on either side of the pediment, within the frieze below, but it was also known as Higham’s Buildings. The design is a dignified treatment of the Ionic order of classical architecture, and in keeping with the fine position of the building, which should still further advance the evident progress of William-street as one of the main business thoroughfares of the city. The first tenants of shops fronting Wellington Street were Grundy & Co (outfitters), Martha Shannon (ladies underclothing) and Watson’s Supply Stores. The William Street shops accommodated a branch of Washington & Co (tobacconists), the Alexandra Tea Rooms and Dan Casey (stationer). The Universal Shoe Stores was located in the corner shop. In the basement was a billiard saloon run by Thompson and James. In the offices on the first and second floors was a variety of tenants including financiers, solicitors, stock and land agents, the Royal Health Institute and also rooms for Robert Bastow, who was the first caretaker for Higham’s buildings. With the Perth Railway Station just across the road on Wellington Street, the offices also attracted a number of railway related tenants such as the Railway Officer Assistant of Western Australia, the Western Australian Locomotive Drivers’ Union and the Western Australian Society of Railway Employees. When Harry Higham died in 1917 the property went to his sons, Harry and William, who were at the time both farming in the Williams district. The use of the building remained much the same with retail shops at the ground level and commercial businesses in the basement and upper floors. Over the years most of the tenancies changed frequently. One of the longest tenants would be the Royal Heath Institute (or Perth Health Institute) and the “Ladies College of Health” which were opened in 1914 and operated by Mrs R McIllwraith. The Institute eventually became the McIllwraith Health Institute, still operated by the McIllwraith family until 1942. The Wellington Buildings was later purchased by Mary and Arnold Raine who also owned the Wentworth Hotel on the opposite side of William Street. Mary Raine (nee Carter) came to Perth in 1900 with her sister and her first job was at the Hotel Metropole (next to the Theatre Royal). 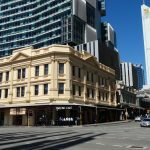 Mary became a well-known personality in Perth’s hotel trade at this time, having rebuilt the Wentworth Hotel which became her home and eventually the core of what became Raine Square. She married Arnold (Joe) Raine in 1943 and together the Raines built a handsome business empire together. Sadly, after only 14 years of marriage, Joe died of arteriosclerosis. Mary was devastated by this loss, and renounced her interest in Joe’s will and instead bequeathing it to the University of WA to set up the Raine Medical Research Foundation in 1957. In 1961, Mary gifted the Wellington Buildings to the University of WA, which would go on to acquire all the properties bounded by Wellington, Murray, Queen and William streets. Together the properties formed the endowment of the University’s Raine Medical Research Foundation, with the income from the properties going towards medical research. In 1989, the University sold Wellington Buildings to Alberni Pty Ltd. In 2002, the State Government finalised its plans for a rail link south of Perth to Mandurah. The city section of the route involved the building of a railway tunnel underneath William Street including a new train station. Two options for the tunnel and station construction were considered both of which would affect the Wellington Buildings as well as many of the buildings located in the Wellington/Williams Street area, and which included possible demolition. However, because of the building’s important heritage significance, it was agreed to retain it although significant works would need to be undertaken. In 2004, the ownership transferred to the Western Australian Planning Commission and the building was vacated. The building was pinned to support it during construction works, the ground floor was stripped and all the suspended canopies removed. Original fabric, such as the pressed metal ceilings and timber floors, were retained in situ or otherwise temporarily removed during the construction works and later reinstated.